How to design an instant classic. 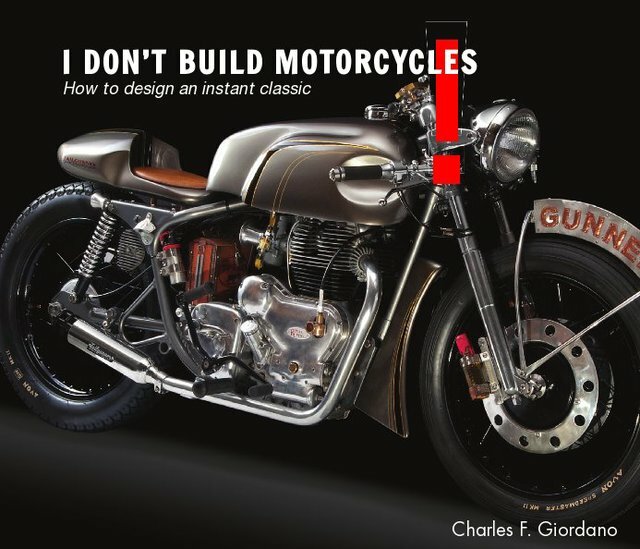 I DON’T BUILD MOTORCYCLES is about more than chronicling the making of this classic motorcycle. It is an anthology of design principles, experiences, and philosophies that will help you with your next creation. It's a Zen and The Art of Making book. It consists of dramatic photographs, pertinent quotes, and allows you to witness the building of a classic motorcycle. But the book provides much more than that; it stresses the importance of purposeful perception. It provides advice on how to make your ideas a reality. It's also about feeling confident in your thoughts and aspirations. This is a book full of ideas which will appeal not only to motorcycle enthusiasts and mechanics, but also to those in the crafts and design fields. Those seeking to develop their imagination and creativity will find I DON'T BUILD MOTORCYCLES to be invaluable. Charles F. Giordano owns two motorcycle exhaust manufacturing companies: Tailgunner Exhaust, and Von Braun Exhaust. In addition to building motorcycles, he plays the fiddle every day, designs, photographs, keeps bonsai trees, restores old pinball machines, tinkers with stuff, and tries to be a decent husband and father. He is a graduate of the College of Imaging Arts & Sciences at Rochester Institute of Technology, and lives at the end of a long dirt road on Martha’s Vineyard, Mass., with his family, chickens, and a myriad of pets.